LAS VEGAS – Promoter Bob Arum was still fuming about the split-decision verdict that went against Manny Pacquiao on Saturday and said there would be no rematch with Timothy Bradley unless Nevada attorney general Catherine Cortez Masto launches an investigation. Bradley, a 4-1 underdog, upset Pacquiao in one of the most controversial outcomes in years to take the World Boxing Organization welterweight title. All three judges scored it 115-113, with Duane Ford and C.J. Ross seeing it in favor of Bradley and Jerry Roth siding with Pacquiao. The rematch that Bradley thought he would get may be on hold, at least for a while, however. Arum, whose company promotes both fighters, said his feeling that Pacquiao had won a wide decision had not changed a day later. But because of the outcry among the fans and media, many of whom accused Arum of somehow rigging the outcome, the veteran promoter said he would demand an investigation. "I want to investigate whether there was any undue influence, whether the [Nevada Athletic Commission] gave any particular instruction and how they came to this conclusion," said Arum, who at the post-fight news conference was adamant the result was a mistake but not the result of any chicanery. "But the whole sport is in an uproar. People are going crazy. "If this was a subjective view that each of [the judges] honestly held, OK. I would still disagree, but then we're off the hook in terms of there being no conspiracy. But there needs to be an independent investigation because it strains credulity that an event everybody saw as so one-sided one way all three judges saw it as close. It strains credulity." Ford spoke by telephone to Yahoo! Sports on Sunday. He said the criticism is a part of the job he accepts, but said those criticizing the outcome are almost certainly not familiar with the way fights are judged. "If this were 'American Idol', without a doubt, Manny Pacquiao would have won," Ford said. "But it was not. I gave an honest opinion. I had Pacquiao up 4-2, I think, at the end of six rounds. I thought he hurt Bradley a couple of times early in the fight. But when the bell rang to end that round, it was over and what happens in one round doesn't carry over to the next round. They're separate units. "In the second half of the fight, Pacquiao picked off a lot of punches to the head, but Bradley landed some hard body shots. That hurt Pacquiao. I don't mean it hurt him in the sense of it physically hurting him, but in terms of scoring and piling up points. Bradley did an excellent job standing his ground as a boxer. 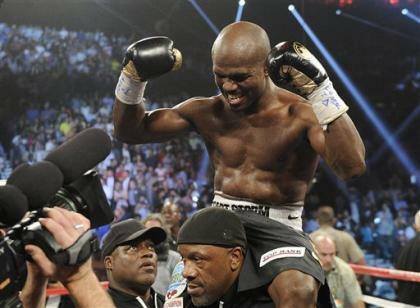 Remember, it's a boxing match and Bradley demonstrated his ability to box expertly." Bradley has been harshly criticized by many who believe Pacquiao won, but the fact that Bradley won the fight with two badly injured feet should say something about his tenacity. And the bout might suggest that Pacquiao is declining more than previously thought. If he had trouble with a fighter who had two injured feet and needed a wheelchair to attend the post-fight news conference, how difficult would it have been for him had his opponent been completely mobile? Bradley injured his left foot in the second round when he pivoted. His manager, Cameron Dunkin, said an examination late Saturday revealed torn ligaments that will keep him off it for several weeks to a month. He said the X-ray did not show a fracture, but doctors ordered an MRI on Monday in Palm Springs, Calif.
"They said that just because the X-ray did not show a fracture didn't mean there isn't one," Dunkin said. "He has a lot of pain on the top of the foot and there are 700 bones in there. Some of them are so small. The doctor said the only way to tell if there is a fracture is to do an MRI." He said there was no serious injury to the right foot, which was far more swollen than the left. "The right was just kind of rolled and it was basically a twisted foot that was pretty swollen," Dunkin said. Dunkin also said he was fine if Arum chose not to arrange a rematch. He said Top Rank promotes Bradley and owes him a fight. If it chose not to make a rematch with Pacquiao, it would have to book a different fight for Bradley. Juan Manuel Marquez, who lost a controversial decision to Pacquiao on Nov. 12 in the same arena, was in attendance Saturday, Top Rank president Todd duBoef said, because the company was planning to make Pacquiao-Marquez IV in the event of a Pacquiao win. That changed in light of the outcome, and Pacquiao said he wanted a rematch. Ultimately, Arum will likely accede to Pacquiao's wishes. Pacquiao's next fight almost certainly will not be in Las Vegas after the uproar over Saturday's fight. Ford, though, said it is unfair for those who don't know the scoring criteria and who weren't focusing intently on the fight to bash the judges. "In pro boxing, you look for damage, and if the punches are equal and the damage is equal, you are looking for effective aggression, and that does not necessarily mean the guy going forward," Ford said. "Effective aggression can be a guy going back. And then you look at ring generalship, and that's all about control. "When you score a fight of that magnitude, you know the criticism comes with the job. But unless you are totally focused on that scoring zone for three minutes, it's impossible to score the fight correctly. I know you can't do it talking into a microphone. It was a close fight in my mind that could have gone either way. The result was nothing more than three judges giving an honest opinion, and nothing other than that." Arum told media at ringside that Dunkin had scored it 116-112 for Pacquiao, but Dunkin angrily denied that Sunday. Dunkin said he had it 115-113 in favor of Bradley. He said he understands the uproar, but said most of it is because of Pacquiao's huge popularity. "If they're fighting on a street and we're just scoring the fight, the whole fight, I can see you thinking maybe Pacquiao won it," Dunkin said. "But when you score it round by round, I think it's very reasonable to believe Bradley won."